Full equipment for in situ static and dynamic plate loading testing including, monitoring and measurement equipment as well as software for processing and presentation of the measurements. Full equipment for Dynamic Cone Penetrometer Testing is available for the determination of the in situ CBR, Bearing Capacity and Degree of Compaction of the soil layers tested. Moreover our office has develop relevant software for processing and presentation of the measurements. Full equipment for the installation of inclinometers monitoring as well as settlement equipment together with software for processing and presentation of the measurements. 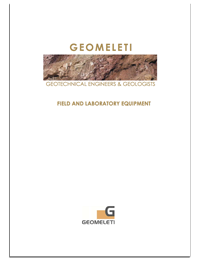 Full equipment for Pressuremeter Testing is available for the measurement of the in situ deformation of the soil and soft rock caused by the expansion of a cylindrical flexible membrane under pressure. The equipment consists of Menard digital pressuremeter, data acquisition unit and data processing software. Full equipment for the in situ density measurement tests by the “Sand Replacement Test” method, as well as the appropriate software for processing and presentation of the measurements. Full equipment and specialized personnel for in situ sampling of materials, concrete, asphalt, “hard” embankment core sampling.